As almost all of the threads in this folder focus on Northern Hemisphere glacier, I thought that I would expand this thread to include other Southern Hemisphere (and some tropical) glaciers. Abstract: "The aim of this paper is to provide the community with a comprehensive overview of the studies of glaciers in the tropical Andes conducted in recent decades leading to the current status of the glaciers in the context of climate change. In terms of changes in surface area and length, we show that the glacier retreat in the tropical Andes over the last three decades is unprecedented since the maximum extension of the Little Ice Age (LIA, mid-17th–early 18th century). In terms of changes in mass balance, although there have been some sporadic gains on several glaciers, we show that the trend has been quite negative over the past 50 yr, with a mean mass balance deficit for glaciers in the tropical Andes that is slightly more negative than the one computed on a global scale. A break point in the trend appeared in the late 1970s with mean annual mass balance per year decreasing from −0.2 m w.e. in the period 1964–1975 to −0.76 m w.e. in the period 1976–2010. In addition, even if glaciers are currently retreating everywhere in the tropical Andes, it should be noted that this is much more pronounced on small glaciers at low altitudes that do not have a permanent accumulation zone, and which could disappear in the coming years/decades. Monthly mass balance measurements performed in Bolivia, Ecuador and Colombia show that variability of the surface temperature of the Pacific Ocean is the main factor governing variability of the mass balance at the decadal timescale. Precipitation did not display a significant trend in the tropical Andes in the 20th century, and consequently cannot explain the glacier recession. On the other hand, temperature increased at a significant rate of 0.10 °C decade−1 in the last 70 yr. The higher frequency of El Niño events and changes in its spatial and temporal occurrence since the late 1970s together with a warming troposphere over the tropical Andes may thus explain much of the recent dramatic shrinkage of glaciers in this part of the world." Abstract: "The temporal and spatial patterns of late Holocene climate conditions provide valuable information for testing hypothesized mechanisms of recent climate changes. As a proxy for late Holocene climate in the southern tropics, we present a 10Be chronology of moraines deposited by Qori Kalis, an outlet glacier of Quelccaya Ice Cap in Peru. The Qori Kalis moraines are located downflow from the Quelccaya ice cores and provide the first glacial extent record that can be compared directly to annually resolved tropical ice core records. Qori Kalis advanced to its late Holocene maximum extent prior to 520 ± 60 yr before CE 2009, when Quelccaya ice core net accumulation values were at or below their late Holocene average. Subsequent glacial retreat between ∼520 and 330 yr before CE 2009 coincides with the highest net accumulation values of the ∼1800-yr-long ice core record. Therefore, we suggest that temperature, rather than net accumulation, was the primary driver of these glacial fluctuations. Comparison of the late Holocene fluctuations of Qori Kalis glacier with glaciers in the southern tropical Andes, Patagonian Andes, Switzerland, Alaska, and New Zealand suggests globally synchronous, centennial-scale cold events." In the linked 2011 reference the researchers found that 270 of the largest glaciers between Chile and Argentina have melted “10 to 100 times” faster in the past 30 years than they have during any period since 1650. Abstract: "The melting of mountain glaciers and ice caps is expected to contribute significantly to sea-level rise in the twenty-first century, although the magnitude of this contribution is not fully constrained. Glaciers in the Patagonian Icefields of South America are thought to have contributed about 10% of the total sea-level rise attributable to mountain glaciers in the past 50 years. However, it is unclear whether recent rates of glacier recession in Patagonia are unusual relative to the past few centuries. Here we reconstruct the recession of these glaciers using remote sensing and field determinations of trimline and terminal moraine location. We estimate that the North Patagonian Icefield has lost 103±20.7 km3 of ice since its late Holocene peak extent in AD 1870 and that the South Patagonian Icefield has lost 503±101.1 km3 since its peak in AD 1650. This equates to a sea-level contribution of 0.0018±0.0004 mm yr−1 since 1870 from the north and 0.0034±0.0007 mm yr−1 since 1650 from the south. The centennial rates of sea-level contribution we derive are one order of magnitude lower than estimates of melting over the past 50 years, even when we account for possible thinning above the trimline. We conclude that the melt rate and sea-level contribution of the Patagonian Icefields increased markedly in the twentieth century." Abstract: "The ongoing global glacier retreat is affecting human societies by causing sea-level rise, changing seasonal water availability, and increasing geohazards. Melting glaciers are an icon of anthropogenic climate change. However, glacier response times are typically decades or longer, which implies that the present-day glacier retreat is a mixed response to past and current natural climate variability and current anthropogenic forcing. Here, we show that only 25 ± 35% of the global glacier mass loss during the period from 1851 to 2010 is attributable to anthropogenic causes. Nevertheless, the anthropogenic signal is detectable with high confidence in glacier mass balance observations during 1991 to 2010, and the anthropogenic fraction of global glacier mass loss during that period has increased to 69 ± 24%." This is in just over one year! That is just one of the cities in the high Andeas and all of them are in the same situation. BTW Pop of La Laz is around 800,000. Article with spectacular Youtube clip link below. In December 1977 I hitch hiked (via motorcycle from the coast!) to the toe of Frans Josef Glacier and walked on some beautiful blue ice. Without hobnails or cleats, footing was rather precarious! Image from the internet shows approximate extent then. Curious that this glacier advanced from 1985 to 2006. Tor, a lot of the Norwegian glaciers in the West (lots of precipitation) expanded as well around 2000. Likely explanation is the increased snowfall from a warmer climate, but that doesn't help a decade or so later when much of that snow falls as rain. Loong time since this thread was active, here's an update on Peru's tropical glaciers. Elements of "places less liveable" and "tsunamis/landslides from glacier collapse" in this write up as well. Thanks for the post. I was perusing topics I seldom follow and found your entry most interesting!. 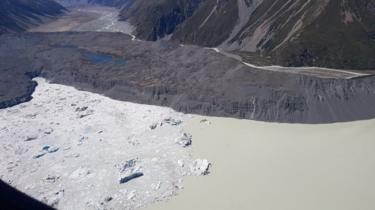 Huge chunks of ice have broken off the Tasman Glacier, New Zealand's largest. The lake started to form in the 1970s as the glacier rapidly retreated - a phenomenon thought to have been largely caused by global warming. 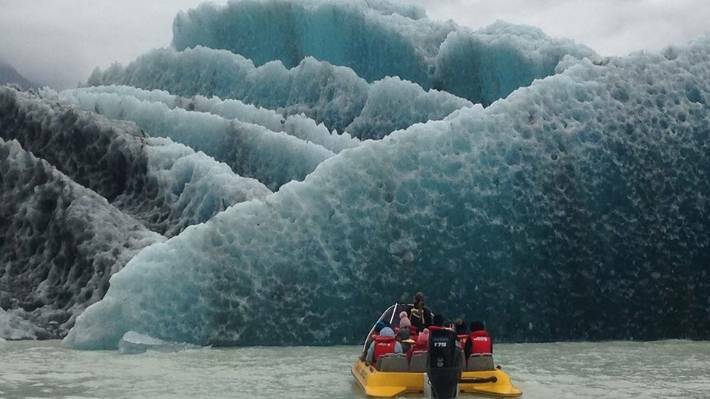 The falling ice chunks led to some "chaos" on the water, Anthony Harris, a guide at Southern Alps Guiding, told the stuff New Zealand website. "All in all, this is the most significant event I've seen in the last five years on the Tasman."